The Yoga Lodge on Whidbey Island is an educational center that offers lodging for individual and group yoga and wellness retreats. Resting on 10 acres of splendid landscapes within close proximity to the village of Greenbank, the inn offers a tranquil sanctuary to escape from the hustle and bustle of daily life with comfortable accommodations and a variety of sacred practices such as meditation, yoga, and Ayurveda to partake in. The Yoga Lodge on Whidbey Island offers ongoing yoga classes, private yoga sessions, short workshops or weekend retreats that focus on a range of meditation, yoga, and Ayurveda practices to inspire clarity, vision, and an understanding of life. 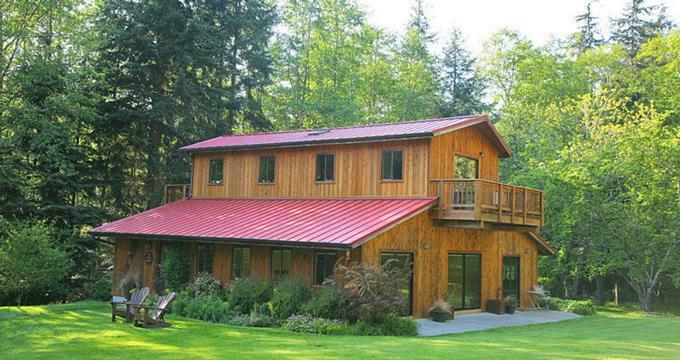 Accessed via an easy drive from Seattle or Bellingham, The Yoga Lodge provides a serene sanctuary for a wide variety of workshops and seminars, including meditation, yoga, t'ai chi, massage training, wellness seminars, musical and writing groups, and modern dance. The Lodge houses a spacious, airy studio with heated flooring and gorgeous forest views that can accommodate between 11-16 people, depending upon the activity and includes all necessary equipment needed such as eco-mats, chairs, blankets, belts and other yoga props. The lodge also features comfortable sleeping quarters for up to 11 people, housing three or four guests per room with shared bathrooms. The Yoga Lodge on Whidbey Island features comfortable sleeping quarters for up to 11 people, housing three or four guests per room with shared bathrooms. Ganesha sleeps two guests with queen-sized beds with clean linens and pillows, a private bathroom with a shower, sink, and toilet and a secluded deck with pleasant views. Saraswati accommodates up to four guests with two single beds and two single loft beds and a shared bathroom, while Tara sleeps up to four people with one double bed, one single bed and two single loft beds with a shared bathroom. Lakshmi sleeps three people with two single beds and one single loft bed with clean linens and pillows, and a shared bathroom with showers, sinks, and toilets. Facilities and amenities at The Yoga Lodge on Whidbey Island include comfortable accommodations with private or shared bathrooms, kitchen privileges for self-catering purposes, complimentary organic coffee and tea, and access to the sauna. The lodge has a bright, airy studio with heated flooring where a variety of workshops and seminars are held and is surrounded by beautifully maintained gardens, orchards, and a network of nature trails ideal for walking, hiking and mountain biking. Whidbey Island is the largest of the rural islands that make up Island County in Washington, along with Camano Island and lies 30 miles north of Seattle. Whidbey and Camano Islands offer an array of things to see and do, from scenic natural beauty and gorgeous landscapes to wide beaches, outdoor adventures, excellent restaurants, cafés and bars, and an array entertainment.